Get Fit. Stay Fit. For Life. gets your teenage children involved in a healthy and active way of living? Here you’ll find all the information you need to begin your journey to a lifetime of better health. 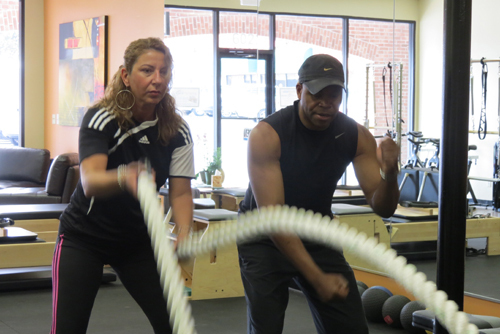 As a personal trainer located in the heart of Sandy Springs, GA and with more than 18 years of experience, I know what works and what doesn’t work when it comes to getting results from your workout. So, whether you’re looking to tone up and lose a few extra pounds, train for a sports competition or dramatically transform your body, I can help you get the job done! Now, I won’t promise you quick fix results. But, what I can promise you is that I’ll be right there with you every step of the way as a dedicated trainer and a friend. So, if you’re ready to get fit and stay vital, I invite you to a complimentary training session at our Get Fit – Personal Training studio conveniently located in Sandy Springs, GA, less than 1 mile outside of I-285 off Roswell Road. The address is Centre Court Shopping Center, 6022 Sandy Springs Circle, Sandy Springs, GA 30328. Call me today at (678) 595-1064 and I’m looking forward to welcoming you at our studio.